MILAN — Euroskeptic populist parties formed a new and expanded right-wing alliance on Monday that aims to become the strongest faction in the European Parliament and seeks to radically transform European Union policies on migration, security, family and environment. Italy's hard-line interior minister, Matteo Salvini, leader of the anti-migrant League party, told a news conference in Milan that the goal of the new movement in the EU-wide elections next month was to "win and change Europe." He was joined by representatives of populist parties from Germany, Finland and Denmark. At the top of their common agenda, the right-wing euroskeptics demanded a halt to all illegal migration, stronger European borders, restoring political sovereignty to EU nations and protecting what they called "European culture." Salvini rejected any characterizations that the movement, which includes far-right parties, is made up of political extremists flirting with Europe's totalitarian history. "Today at this table there are no nostalgic extremists," Salvini said. "The only nostalgics are in power in Brussels. Today, we look ahead with a clear memory of what happened in the past, but the tired debate of right, left, fascist, communist, is not what makes us passionate." Political experts say the May 23-26 European Parliament vote could prove to be a tipping point in post-war European politics, if traditional political powerhouses lose support and extremist, populist parties gain more clout. The vote, which involves 705 seats this year, is run as national ballots in each of the bloc's states. National political parties with common ideology then unite in EU-wide groups, like the center-right EPP, the center-left S&D Socialists or the liberal, pro-business ALDE. The new euroskeptic alliance, launched under the banner "Toward a Europe of common sense," expands on the parliament's four-year-old Europe of Nations and Freedom Group (ENF), which already includes France's far-right National Rally, Austria's Freedom Party and the Netherland's Party for Freedom. 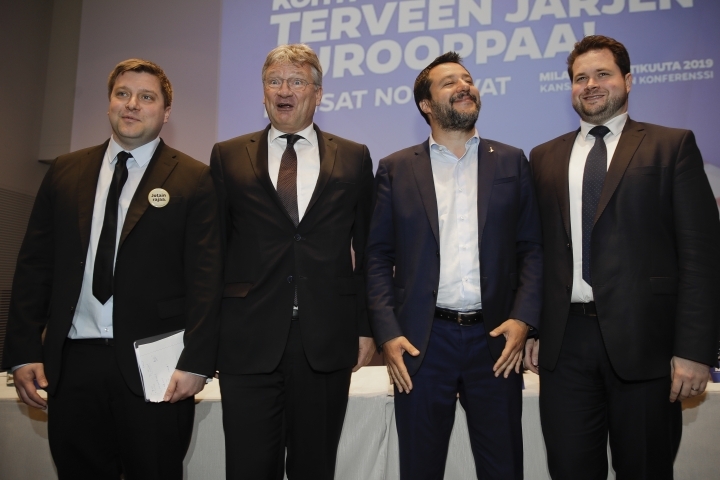 Salvini was joined Monday by the far-right Alternative for Germany's co-leader Joerg Meuthen, Olli Kotro of the euroskeptic populist party The Finns, and Anders Vistisen of the right-wing, populist Danish People's Party. Those parties now come from other parliamentary groups, the European Conservatives and Reformists (ECR) and the Europe of Freedom and Direct Democracy (EFDD). Salvini met last week in Paris with National Rally leader Marine Le Pen to cement their long-time alliance before the expansion announcement. He said the participation of the other ENF parties wasn't planned for Monday. Instead, they were expected at a rally in Milan on May 18. Also missing from the meeting was Hungarian leader Viktor Orban, whose party has been suspended from the main center-right alliance in the EU parliament over values and policies. Despite the tensions, any move from Orban to join the new populist group might be seen as a provocation within the European People's Party. 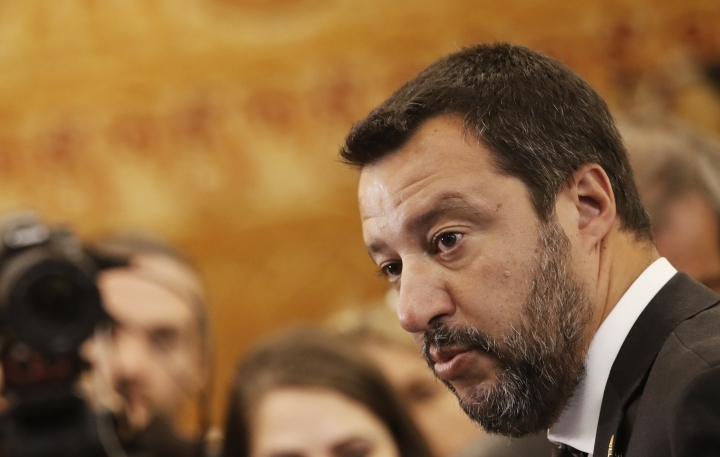 Salvini identified Islamic extremism — not political extremism — as the main threat to security in Europe. "As interior minister for 10 months, the No. 1 risk in Italy and Europe is Islamic extremism, Islamic fanaticism, Islamic terrorism," Salvini said. "There are extreme-right and extreme-left minorities in Italy and in Europe, (but) they fortunately are controlled and of limited numbers." The leaders said their invitation was open to all like-minded parties to join the new bloc, which will be formed after the parliamentary election. That included any parties from Britain if Brexit hasn't happened by the time European elections roll around. Salvini also said the new group, if it wins a European parliamentary majority, would cancel for good the process of inviting Turkey, a Muslim majority nation, to become an EU member. That process has been already stalled for years, much to Turkey's anger. Salvini's move to solidify the populist movement in Europe, meanwhile, was criticized by his coalition partner at home, 5-Star Movement leader, Luigi Di Maio. Di Maio, in a letter to Corriere della Sera, wrote that Salvini was aligning with parties that influence policies in countries that have refused to help Italy with the migrant crisis. Despite the fact that two governing parties will be competing for votes in Italy that could well rebalance power in the coalition, Salvini denied that the European elections would impact the government. 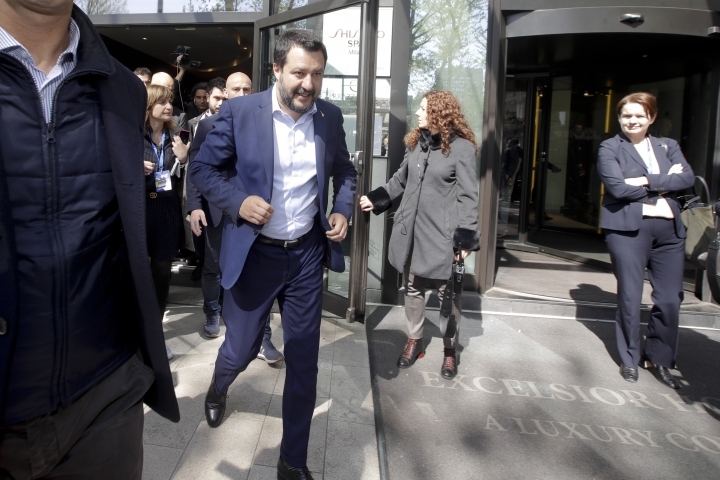 "Because I don't comment on what my allies do," said Salvini said, who then made a sideways reference to Di Maio's meetings in Paris with yellow vest activists seeking to run for European Parliament, creating diplomatic tensions with France. Jan M. Olsen contributed from Copenhagen and Pablo Gorondi from Budapest, Hungary.